shooting accuracy it doesn't seem to. able to draw the bow. 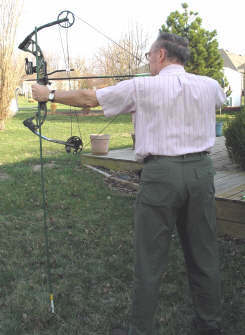 One problem you need to avoid when using the shooting stick is twisting the bow handle ("torquing" the bow as it is sometimes called) as you grip the stick and handle together. Totally relax the wrist of the bow hand to avoid this problem. When using the Lock-a-Draw this is easily done because you are not holding the draw. The shooting stick may also be useful for physically fit archers, particularly when setting their sights. 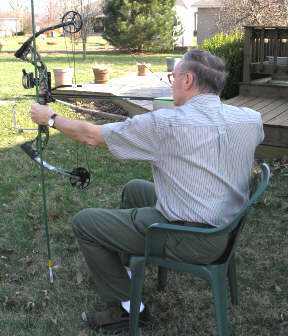 As useful as the shooting stick is for holding the bow stable, it is not adaptable to hunting from a tree stand. The next page, Disabled Bowhunting, introduces the Compound Bow Rest and Holder. It is the ideal companion for the draw keep when hunting from a tree stand.